Sergio Leone is best known for helming the epic spaghetti western trilogy that features A Fistful of Dollars, For a Few Dollars More, and perhaps his most famous film, The Good, the Bad, and the Ugly. His final feature film, however, was something very different from his previous works. In 1984, Leone released Once Upon a Time in America, a film that has become a sprawling gangster epic. When it was first released, its run time was cut down to two hours and twenty minutes and the chronology of the movie was changed to make it happen in chronological order, while the original length was more like 4 hours with a story told through flashbacks. The shorter version is the one people would much rather forget, so today I’m going to be looking at the longest cut, which runs over four hours, set in the proper order, and features scenes not shown in previous American releases. After living a life of crime and excitement, small time New York gangster Noodles (Robert De Niro) is forced to leave the city and go into hiding for over thirty years. After all this time away, he is mysteriously called back to New York City by an unknown part for an unknown reason that involves a bag full of money that was stashed in a locker at a train station when Noodles and his friends were kids and just getting started in their life of crime. Upon his return, he is overwhelmed with memories of meeting his best friend and partner, Max (James Woods), a friendship that over the years got more and more strained as motivations and relationships stood in the way of their goals. As Noodles starts piecing together the mystery of who summoned him, he also takes the time to reflect on the decisions and the action that got him to the lonely place he finds himself in the later years of his life. One of the most important thing about any movie is the characters that are created for the audience to relate to or understand or anything like that. To me, some of the most memorable characters come from gangster movies because I really enjoy the depth of the best gangster characters, but I also see the more revolting sides of the personality as something that truly gives their characters weight. That how most of the characters in Once Upon a Time in America are created. Noodles and Max are two sides of the same coin and create a relationship dynamic that is typical for this genre but feels different and, because of the film’s run time, explored in a much finer way. Even the side characters in the film have unique character traits that make them memorable, and never does the large cast ever seem to blend together in any way. De Niro and James Woods are both excellent in their roles, and I also have to give props to Elizabeth McGovern for her role as Deborah, a character with one of the most unsettling stories of all the characters in the film. 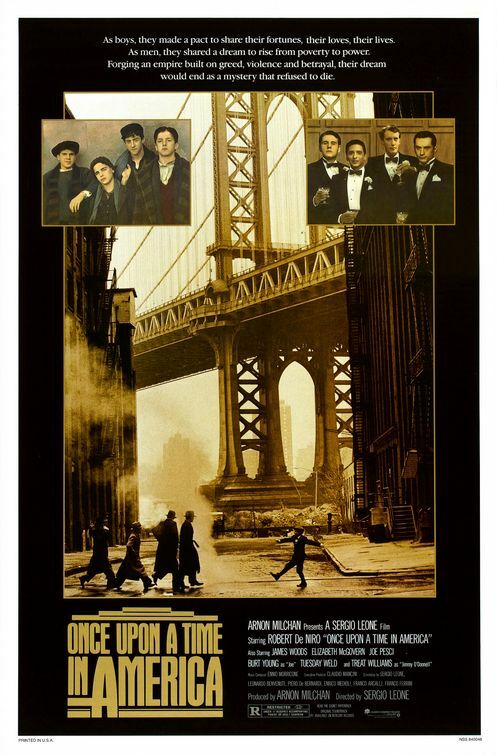 While crime and typical gangster themes are explored in this movie, the themes explored in Once Upon a Time in America feel grander in scale than most movies in this genre. Part of the reason these themes resonate so well is the fact that the story is told through flashbacks and not in chronological order. When Noodles returns to New York City, there’s this noticeable level of sadness and disconnect that he feels towards everything. When the story goes back in time to the 1930s, we see why these feelings exist. This creates themes of loneliness, friendship, loss, and the strongest of all those explored, regret. To me, that’s what stuck with me the most is the regret that Noodles feels towards his life and his choices. This makes every death or separation feel all the more powerful. I can’t talk about a Sergio Leone movie without talking about his artistry behind the camera. 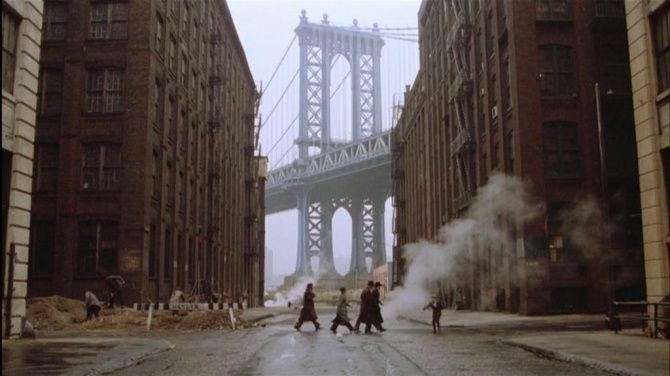 Like all of his other films that I’ve seen, Once Upon a Time in America is a gorgeous cinematic experience. The sets that are built combined with his wide angle style of shooting makes this epic film seem grander than most. The color pallet is also something to notice with the past having a much warmer pallet as compared to the present time where the world is covered with neon lights and blues and grays. His collaboration with cinematographer Tonino Delli Colli, who worked with him on his previous two films, also adds a lot with his camera work and lighting. Finally, I have to mention Ennio Morricone’s beautifully realized score that turns the emotions, loves, and losses of the characters into incredible music. It’s a solid reminder of why he’s my favorite film composer. Once Upon a Time in America is both a technical achievement while also acting as a haunting tale of impulsion and consequences. This is the kind of movie that can serve as a reminder to any cinephile as to why they love movies and the process behind their creations. Sergio Leone is truly a master of his craft, and everyone involved successfully created one of the most memorable gangster films ever made. Just make sure you stray away from the heavily cut American release and find the longer versions to truly get the full impact of the story. It’s not one to be missed.